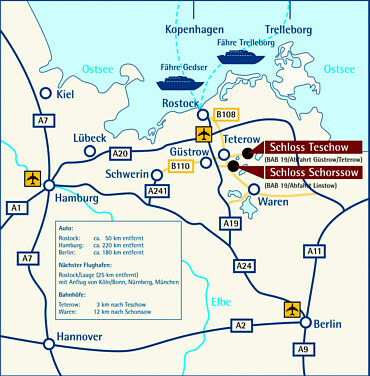 "Fly Teschow": In only 25 minutes from the airport Rostock-Laage to Schloss Teschow! By train: The next station is Teterow. A transfer is possible. Please inform us on time. Coming from Berlin (about 180 km): Travel on motorway (Autobahn) A 24 up to junction Autobahndreieck Wittstock. Switch onto motorway A19 in the direction of Rostock. Take exit Guestrow Sued / Teterow and drive on road B 104 towards Teterow. After approximately 20 km, you'll reach the town of Teterow. Coming into town drive in the direction of Malchin, past the station, another 150 m ahead, then turn left in the direction of Teschow. Go on 4 km and you will reach Teschow. Turn left on the second street. It will take you right up in 500 m to the Golf- und Wellnesshotel Schloss Teschow. Coming from Rostock (only 49 km): Exit the motorway BAB 19 at Guestrow Sued / Teterow and drive on road B 104 in the direction of Teterow. After approximately 20 km, you'll reach the town of Teterow - coming into town, there is a gas station to the right and an Aldi- grocery store to the left. Drive another 500 m ahead and you'll get to an intersection. About 50 meters further is the next set of lights. Turn left here (across the street is the restaurant "Zum Kulturhaus"). After 300 meters, in a curve, you will meet the major road - turn left here (direction of Dargun/Neukalen). Stay on this road. You will pass through a tunnel. Go on another 2,5 km and you will reach Teschow. Turn left on the second street.It will take you right up to the Golf and Sports Hotel Schloss Teschow. Guest coming from Waren (only 20 km): Turn right on the first intersection in Teterow, then turn left right after the next set of lights (across the street is the restaurant "Zum Kulturhaus"). 300 meters down the road, you will get to the major road - turn left here (direction of Dargun/Neukalen). Stay on this road. You will pass through a tunnel. Go on another 2,5 km an you will reach Teschow. Turn left on the second street. It will take you right up in 300 m to the Golf and Sports Hotel Schloss Teschow. Coming from Hamburg (ca. 200 km): Travel on motorway (Autobahn) A 20 up to junction Autobahnkreuz Rostock-Sued. Switch onto motorway A19 in the direction of Berlin. Take exit Guestrow Sued/ Teterow. From Teterow: In Teterow drive in the direction of Malchin, past the station, another 150 m ahead, then turn left in the direction of Teschow. Go on 4 km and you will reach Teschow. Turn left on the second street. It will take you right up in 500 m to the Golf- und Wellnesshotel Schloss Teschow.